A major fire broke out at Latasil area of Guwahati on Thursday. The fire broke out at a commercial establishment named JCB India Limited. 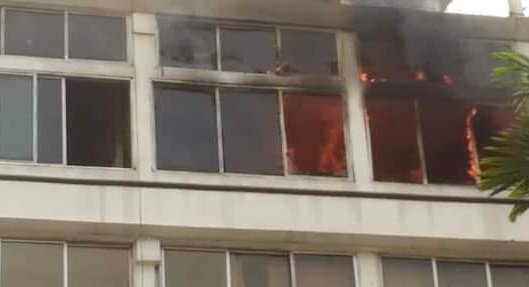 The raging inferno originated in the third floor of the building situated at Latasil area of Guwahati. The fire caused extensive damage to the business establishment. As many four air conditioners, three printers, six photostat machines and several important documents of the commercial establishment. Three fire tenders were pressed into service to douse the fire. According to preliminary reports, it is learnt that the fire was caused by an electrical short circuit.